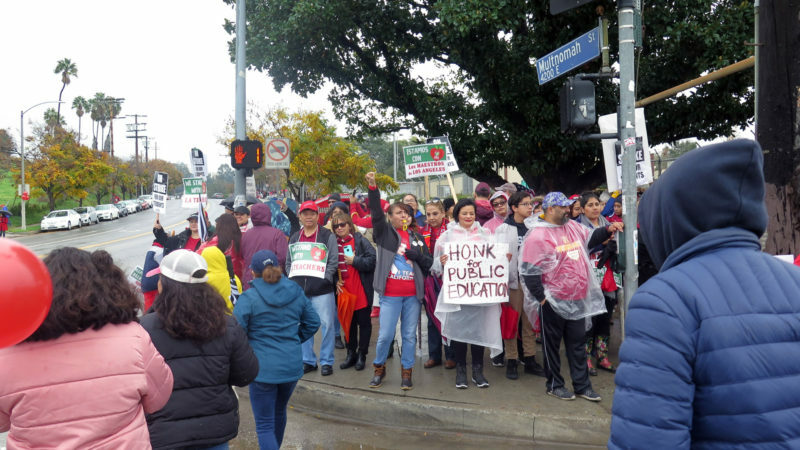 LOS ANGELES — Thirty years ago, when United Teachers Los Angeles (UTLA), the union representing rank-and-file educators in the county’s public schools, went on strike, Nadia Morales and Pedro Martinez were students at Los Angeles High School. Morales was the straight-A, Advanced Placement type and Martinez a class clown, so they had never before shared a classroom. But with all their teachers out on strike, classes were combined, and the two found themselves chatting in what amounted to a massive communal study hall. After graduation, Morales and Martinez got married and trained for careers in education that led them back to their alma mater. Morales started out as an elementary-school teacher, then switched to academic counseling, which she’s done at LA High for the past eleven years; Martinez worked there, too, teaching history and social studies, until six years ago, when he was transferred to another high school in the district. 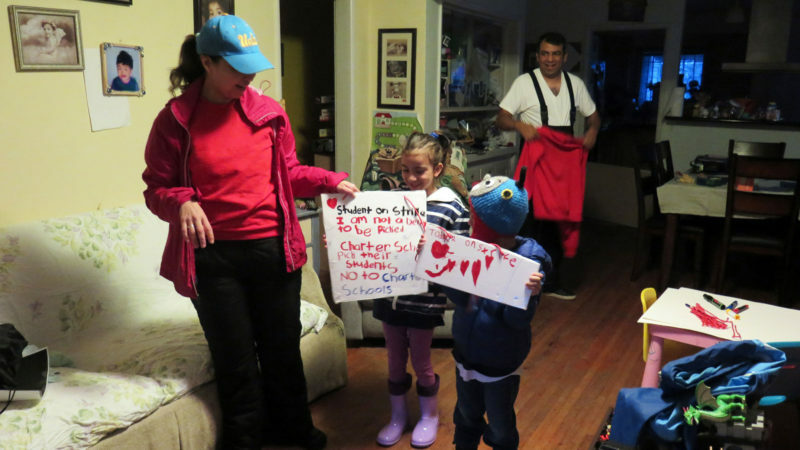 And so, last week, when the couple and their two young children joined the picket line outside LA High, Morales thought of her teachers from three decades ago. “Now, I’m on that side, following their footsteps and what they fought for — for students and future teachers,” she said. 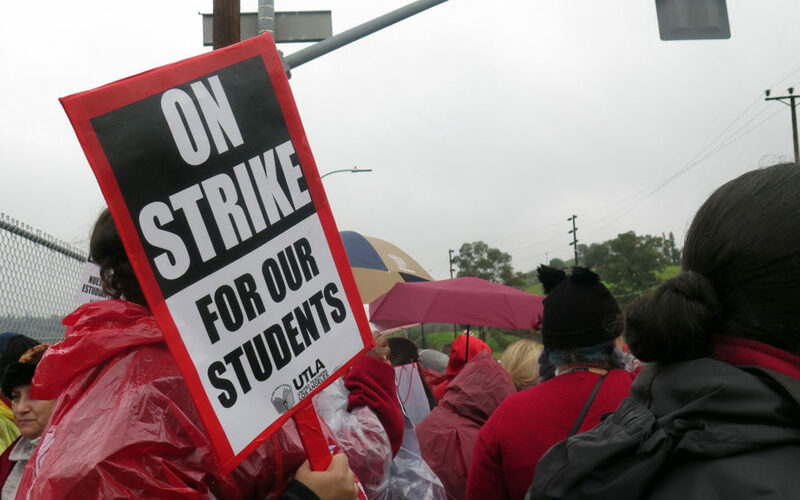 The strike of UTLA’s 33,000 members across some 1,200 schools, the first since 1989, began last Monday, January 14. It was, like most work stoppages, about pay and benefits and an expired collective bargaining agreement. It was also about unteachably large class sizes (of 40, sometimes 50 students) and similarly burdensome ratios for nurses, social workers, librarians, and counselors. 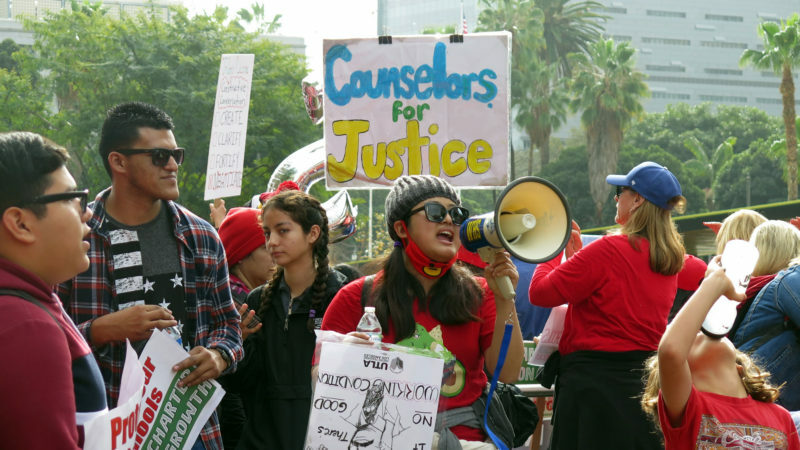 The union’s demand for more counselors, in particular, emerged more strongly than in other recent teacher strikes — because, Morales says, of the increasingly acute needs of LA’s majority brown and working-class student population. Counselors are essential mentors to new immigrants and first-generation college-goers. They connect students and parents to social services and help them integrate into the community. In this sense, the strike was as much about an ideological question as a labor dispute: Who is the public being served by public education? It is impossible not to ask such questions at LA High. The immodestly categorical character of its name owes much to the school’s long history: when it opened in 1873, it was the only high school in Southern California. It has produced a number of eminent alumni, including the actor George Takei and Charles Francis Richter, the inventor of the Richter Scale. Today, LA High is what’s called a community school, intended to serve the surrounding area. But the neighborhood just to the north, Hancock Park, is 71 percent white, with a median income of $85,000; the student body, meanwhile, is 79 percent Latino, 12 percent African-American, 7 percent Asian, and 64 percent “economically disadvantaged,” drawn from Koreatown, Mid-City, and neighborhoods farther afield. One part of the campus is not open to all: since 2016, a small section of LA High has been occupied by a selective, STEM-focused school, Girls Academic Leadership Academy. Related: School counselors keep kids on track. Why are they first to be cut? Morales’s current caseload of 350 — thanks to the school’s use of discretionary funds to hire a third academic counselor — includes every student classified as an English learner. As a Guatemalan immigrant who grew up undocumented, Morales is used to translating concepts from one language to another, but it’s still a challenge to explain the Free Application for Federal Student Aid, known as the FAFSA, to Vietnamese-speaking parents. (“But that’s LA. If you’re from LA, that’s it,” Martinez said.) Morales has, at least, the comparative luxury of being on campus five days a week. LA High can only afford to have a nurse one day a week and a psychiatric social worker, two days a week. When neither clinician is available, medical triage and suicide risk assessments fall to academic counselors, EMTs, and even, worryingly, school police. Inouye was elected on the reform slate of Alex Caputo-Pearl, a Teach for America alumnus-turned-public-sector-loyalist, who became the union president in 2014. Caputo-Pearl’s “Union Power” slate vowed to place a cap on charter schools, support rank-and-file activism, and, if necessary, wield the power of the strike. One of his slate’s first big initiatives was to push for an increase in union dues—perhaps the least ingratiating move possible, yet more than 80 percent of the members, some earning as little as $50,000 per year, voted in favor of the measure. The underlying message — about the need to protect school children against pro-charter forces and the coming of a national right-to-work regime — was clearly articulated and prescient. UTLA has organized charter-school teachers and sued Alliance College-Ready Public Schools, a local charter network, for union-busting. Meanwhile, as collective bargaining continued to stall, more than a year after the contract’s expiration date, an astonishing 98 percent of the more than 80 percent of members who voted agreed to pre-authorize a strike. On Saturday December 15, thousands of red-shirted UTLA members marched through downtown LA. A friend of mine, who has taught in the district since 1985, said he hadn’t seen anything like it for thirty years. The union’s nemesis is Austin Beutner, a former investment banker who became superintendent of the school district last May. Beutner is widely regarded as a Betsy DeVos-style privatizer, and he has the backing of Eli Broad, a billionaire who, in 2015, pushed a $490 million plan to turn half of all LA schools into charters. Although Beutner has acknowledged that “smaller class sizes, more teachers, counselors, nurses, and librarians in schools would make our schools better,” he argued that there was simply no money because of the existing liabilities of retiree pensions and health insurance. 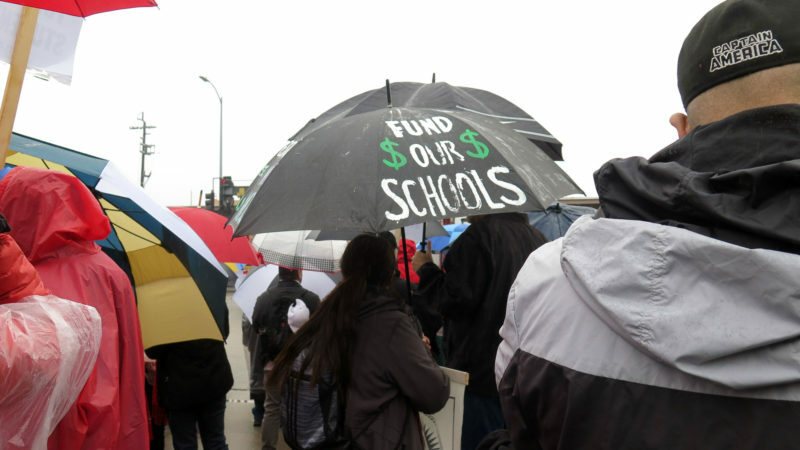 (One member of the overwhelmingly pro-charter School Board that oversees the LAUSD said that sufficient funds did, in fact, exist; when I requested an interview with Beutner, his spokesperson referred me to the district website.) Superintendent Beutner has also refused to touch the district’s $1.8 billion in reserves, citing a projected decline in student enrollment. But, as a state fact-finding report concluded last month, the LAUSD’s ability to retain student levels turns on reducing class sizes, in order to appeal to parents. 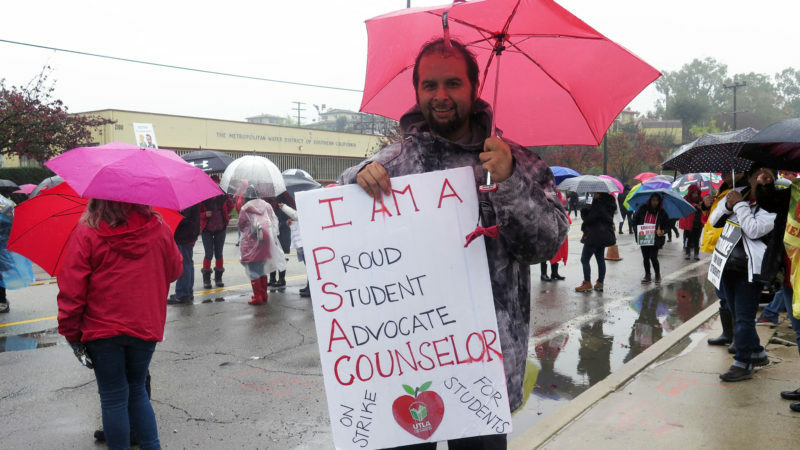 The UTLA represents some 900 charter teachers and staff, but there are limits to solidarity. 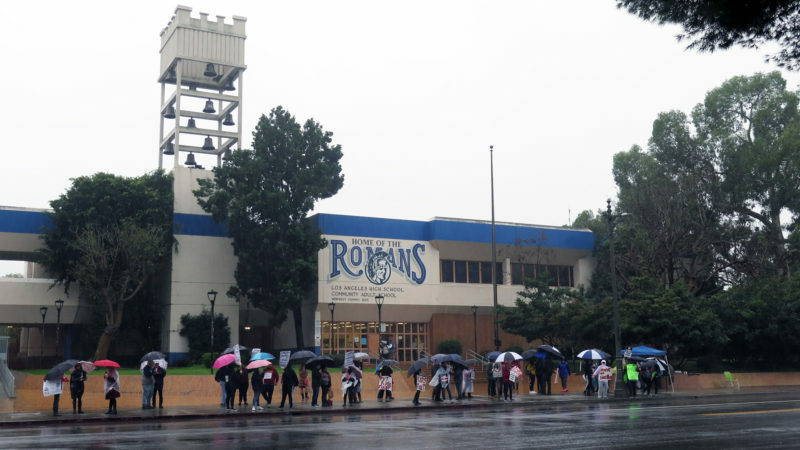 Last week, the teachers at GALA, the all-girls school on the campus of LA High, held a separate, tiny picket down the street from where Morales and her colleagues marched. The “co-location” of charters and other application-only schools on the grounds of traditional public schools is increasingly common. One campus I encountered houses two public schools and two charters. Typically, in addition to the building itself, some human services are shared, such as the nurse, custodian, and sports teams. But, in Morales’s view, this is less a case of community-minded cooperation than of free-riding. Charters, she said, “promise the kids the moon and the stars, and of course they can choose, so they only take the kids they want to take.” LA High took pride in serving everyone in its catchment area. According to Morales and Martinez, many charters begin the school year with a high head count, to maximize their budgets, and then, as the year goes on, send away “difficult” students — those with disabilities or behavioral issues — to their neighborhood schools. But the per-pupil funding isn’t adjusted mid-year, and by the spring semester, schools like LA High see their numbers rise well above what their budgets can stand, with a high concentration of students in need of counseling. At many school-based pickets, and in the crush of tens of thousands of red-shirted teachers at the rallies downtown, I heard talk of other public-sector comrades between chants of “UTLA.” The plight of the furloughed federal employees, an imminent teachers’ strike in Oakland, and last year’s mass walkouts in West Virginia, Kentucky, Oklahoma, and Arizona were on people’s minds. There was also talk of UTLA’s efforts to partially repeal Proposition 13 and to put a moratorium on new charters. “The strike provides that liberated time to talk about things,” said Arturo Romo, a graphics-arts teacher at Sonia Sotomayor Learning Academies in Northeast Los Angeles. On the sidewalk in front of LA High, as passing drivers leaned on their horns and parents and students stopped by to chat, Morales smiled broadly. Neither she nor Martinez was being paid, and the weather during the first four days of the strike had been rainy, even torrential — parts of their street in Glendale ran a foot deep with water — but on Friday, in time for another mass demonstration at City Hall, the sun emerged. Jerry Villafuerte, a former student of Morales’s, came to show his support between classes at LA City College and a part-time retail job. It was Morales, he said, who had guided him through school, and, when a baseball career didn’t pan out, offered alternatives. “I came back after I graduated high school and asked Ms. Morales, “What’s a good major that has to do with sports?” he recalled. The Martin Luther King Jr. holiday gave strikers, students, and parents an extended weekend reprieve, but contract negotiations continued. On Tuesday morning, Caputo-Pearl, Beutner, and Mayor Eric Garcetti held a press conference at City Hall to announce a tentative agreement. Though details of the deal were not yet public and would still have to be approved by the School Board and voted on by union members, Caputo-Pearl said there had been sufficient progress on all the major issues, from class size and counseling hours to charter co-location and salaries. Playing the part of mediator, Garcetti called for an end to caricature: Caputo-Pearl was not an unreasonable bully, he said, nor was Beutner a ruthless privatizer. At 5:00, strikers huddled in meetings with their chapter chairs, dissecting the agreement before taking a vote. It was naturally deflating to go from street protest (one handmade sign: “45 is the speed limit, not a class size”) to legalese (“the District shall reduce class size by 1 from the 2017-2018 Class Size MOU”), and many workers were disappointed in what seemed like minimal movement on the counselor ratio — additional hiring would still leave a ratio of one counselor for every 500 students. Yet there was also an awareness of the vast sums of money behind each decision, and the risks of striking into a second week. Moreover, because the protest had been about ideals — of the value of the public sector and quality education for all — not everything could be achieved through a contract. The UTLA announced, around dinnertime, that a “super-majority” of members had voted to approve the tentative agreement. In less than twelve hours, the school bell would ring. *Correction: This story has been updated to reflect the fact that GALA is an admissions-criteria school, not a charter school.